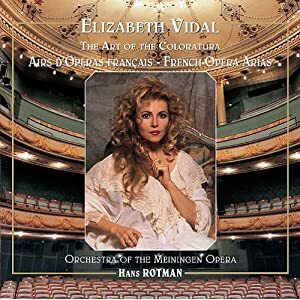 Thomas: Mignon: Je suis Titania la blonde ..
A very interesting voice by the French-born soprano, who sometimes has her first name spelled Elisabeth Vidal. I've had my eye on this singer and this particular disc for some time because I am so drawn to the coloratura soprano voice. I found it to be a very pleasant voice overall, and listened to one of my favourite selections on the disc first: Saint-Saëns" Parysatis "Le Rossignol et la Rose." My absolute favorite recording this has never been better than the one sung and recorded by Rita Streich on Deutsche Grammophon. The more subtle shades of the Streich voice is immediately apparent, though this performance is no slouch. The Thomas selections are especially interesting since we don't often hear many of these operas. The voice seems to have more poignancy/loudness in the upper middle range, which, the higher she sings, becomes more even. It's a well-controlled voice, obviously from great scholarship over the years. I knew of her voice, initially, from an Opera Rara complete recording of "Ginevra di Scozia" by Giovanni Simone Mayr, which prompted my interest in acquiring her solo CD on the Talent label from Belgium. Vidal is very well supported by Hans Rotman and the Meningen Opera Orchestra ... sonics are natural and diction comes through flawlessly. "Contemporary with Natalie Dessay and the possessor of a beautiful, surprisingly un-Gallic voice is the exquisite soprano, Elisabeth Vidal. Her singing is best described as delicious and she remains one of the finest French artists in front of international audiences today. Her timbre, though uniquely her own, bears some resemblance to the floated beauty of the American soprano, June Anderson during her prime - especially in the pure quality of her highest range. Complimenting the sweet, creamy float of Vidal's voice is a cool elegance in her emission, and an extensive range in performance that encompasses almost three complete octaves. 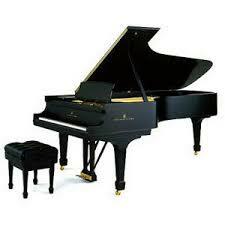 Apparent since the beginning of her professional career this range extends from the low B flat to high A flat. Unfortunately, and inexplicably, Vidal has been overshadowed by her French compatriot, Natalie Dessay. Interestingly, both artists excell in the rarefied region above high C and have received notoriety for their interpolations of such notes as G and A flat above high C. Although Dessay has made numerous trips to America, and has a powerful publicity machine (EMI) behind her, Vidal has mostly sung in European houses and recorded for smaller, independent labels. She seems to have sung in New York City only once: the 1996 Richard Tucker Gala, for which she sang the Doll's Song from Contes D'Hoffmann. Even though she rarely appears in American houses, (during the 2002-2003 season she is scheduled to appear as Norina in Don Pasquale and Juliette in Gounod's Romeo et Juliette with the Florida Grand Opera in Miami) Vidal is a busy singer. She is a frequent guest in all the major theaters in Spain, France, Germany, Greece, and Italy and has sung Olympia and the Queen of the Night (Die Zauberflote) at Covent Garden, Zerbinetta at Aix en Provence. In 1995, she achieved tremendous success with her interpretation of Lakmé at the Paris Opera. Her roles encompass not only the traditional florid repertoire of Donizetti, Delibes, Bellini and Mozart, but also operas by Gluck, Haydn, Cherubini, Poulenc, Stravinsky and Verdi. In addition to her operatic appearances Vidal gives frequent recitals and concerts during each season. Undoubtedly, one of Vidal's finest recordings is a live performance of Auber's rarely performed Manon Lescaut (Chant du Monde LDC 278 1054/55) from Paris, September of 1990. (The first photo on this page is from that performance.) This took place early in Vidal's career and considering the role's great length and mammoth florid difficulties, she gives an unusually poised, bravura performance. During the course of the opera, Manon has at least four arias not to mention duets, trios and ensembles. Vidal's singing sparkles with high notes and clean coloratura as well as limpid legato and feather-like pianissimi. Especially notable is the Act II aria, "Plus de reve qui m'envie" which is capped with a brilliant high F. Her death scene is particularly moving and includes a remarkable phrase (CD 2, end of track 19) sung over harp accompaniment ("Sa femme! Je suis sa femme!") where Vidal jumps from a G above the staff to a perfectly placed, almost supernatural, pianissimo high D. It is a stunning moment. The interesting thing about Vidal's voice is that because of the robust color of its timbre one does not expect her range to include such extreme high notes. It is not, as one would expect, an instrument in the tradition of Mado Robin or Mady Mesplé but rather has more heft than her predecessors. Pepe, how does the voice of Elizabeth Vidal shape up in your catalogue of preferred artists? Do you happen to have the CD that starts this post?